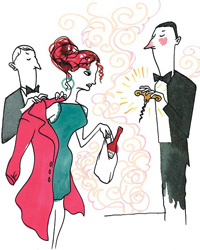 Corkage: The practice of bringing your own bottle of wine to a restaurant to drink is commonly known as corkage. Up until now this has been illegal in Maryland (in fact I believe that Volt got into a bit of trouble last year for allowing this). As of July 1st, 2012 patrons of Maryland restaurants will now be permitted to bring that special bottle when they dine with a couple of conditions: the restaurant must allow it and have a permit to do so from the local liquor board, the wine must be consumed with a meal, and the wine is not available for sale on the restaurant’s wine list. As an aside the last condition should be honored simply as a matter of proper etiquette law or no law. Middletown Wine Festival: A bill passed the legislature that allows a wine festival to be held within the municipal boundaries of the town for no more than two, one-day festivals per year. Packing Heat: Lastly I’m sure you will all feel better and safer that the Legislature will now allow Frederick County’s alcoholic beverage inspector(s) to carry firearms in the course of their duties. I predict that a SWAT team will not be far behind.